A VIDEO PROJECTOR is an image projector that receives a video signal and projects the corresponding image on a projection screen using a lens system. All video projectors use a very bright light to project the image, and most modern ones can correct any curves, blurriness, and other inconsistencies through manual settings. Video projectors are widely used for many applications such as, conference room presentations, classroom training, home theatre and concerts. 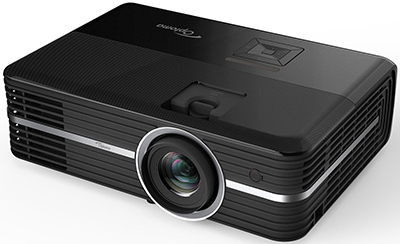 Projectors are widely used in many schools and other educational settings, sometimes connected to an interactive whiteboard to interactively teach pupils. BenQ's HT2550 is a well-priced 4K projector with some minor issues - engadget. BEST MINI PROJECTOR TO TAKE ON THE GO - The Verge. Best Projector for a Home Theater - The Wirecutter. Comparison of display technology - Wikipedia. Epson's latest LCD projector does 4K for $2,000 - "Now there's more competition for 4K -ish projectors." Epson’s short throw laser projector is for anyone that wants a giant screen without the bulk - The Verge. LG's Laser 4K beams a 120-inch picture from seven inches away - "The short-throw projector will be on display at CES 2019." LG's tiny 4K projector puts a 150-inch screen in any room - engadget. OPTOMA UHD60 PROJECTOR review - Wired. Optoma's 4K projector uses Alexa to set the mood for movie night - engadget. Projector Central - "Compare Projectors." Review and information site for anyone interested in projectors, screens and related equipment. We write reviews and commentaries on projectors and projection technologies. Projectors are better, simpler, and probably cheaper than you think - The Verge. Screen Research - since 2001. "Video Projection Screens for the Ultimate Home Theater." Leading manufacturer of state of the art video projection screens, mainly used for home theatre applications, but also in commercial installations. 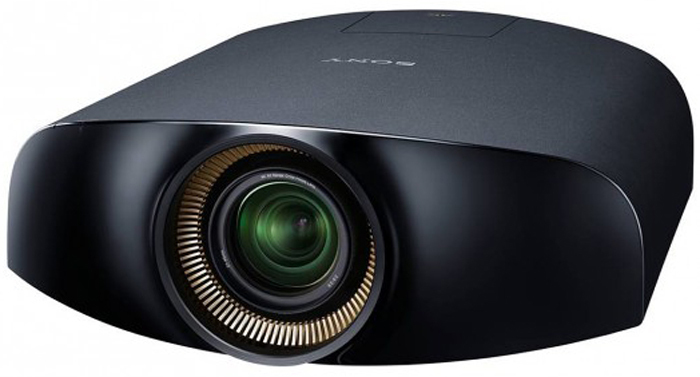 SONY'S 4K PROJECTOR OFFERS MORE THAN MEETS THE EYE/a> - Wired. Sony's $30,000 4K short-throw projector hides powerful sound - engadget. Sony's new short throw 4K projector is $25,000 & brutally beautiful - The Verge. STEWART FILMSCREEN - "The Leader in Filmscreens since 1947." The best $1,000 projector - engadget. The best projectors - engadget. BENQ - all models home theater. CANON - "See Impossible." All projectors. DIGITAL PROJECTION - all models. EPSON - "Ranked #1 in image quality, Epson offers a full line of home theater projectors so you can bring the big screen home." All home projector models. JVC - "Higher Entertainment." Procision 4K Projectors. All models. MCINTOSH MDLP1 Projector - not produced anymore. OPTOMA - "Ultra mobile LED projectors." All models. Extremely lightweight and ultra-mobile, these compact travellers are highly advantageous for executives and consumers on the move. Harnessing the latest LED technology, these projectors provide almost instant start up and shut down times and consistent brightness and colour performance. PANASONIC - "Seeing is believing!" Large-Venue, Installation, Portable, Short Throw, Home Cinema & Space Player projectors. Philips Home Projectors - all models. Philips PicoPix - "Mobile Pocket Projectors." All models. Pioneer Elite PRO-FPJ1 Projector - not produced anymore. SAMSUNG A800 - "Cinematic thrills in your home." Samsung Galaxy Beam - "The ultra slim projector smartphone." 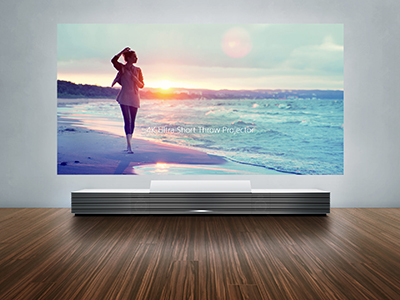 SONY Home Theater Projectors - "Immerse yourself in scenery, art, or movies with an expansive 147-inch image and four times the clarity of Full HD." All models. Sony 4K SXRD Home Cinema Projector - "With more than four times the resolution of Full HD, native 4K offers 8.8 million pixels (4096 x 2160) for a picture that’s so incredibly lifelike, it’s like looking at the real thing." Sony 4K Ultra Short Throw Projector - "Unlock Your Wall to Imagination." Turn your wall into a life-size window to another world. Sony VPLHW45ES - 1080p 3D SXRD Home Theater/Gaming Projector. vivitek Cedia - "Bring the Movies Home." HK2000 Series. UltraHD 4K Projection. vivitek Large Venue - "A Grand Performance." D9000 Series. Super Bright, Technology-Rich. vivitek Qumi Series - "The Ultimate in Portability." Ultra-Portable Projectors.